Your old air conditioner and heater have held up beautifully for their age. But as your units reach their 10-year mark, you may want to consider installing a replacement. Newer heating and cooling systems are more energy efficient than their older counterparts, and you know that newer units will require fewer repairs. When you feel ready to replace your old air conditioner or heater, call Brian’s Heat and Air. We offer affordable cooling and heating installation in Tulsa, OK, and you can trust our team to work quickly and professionally. Brian’s Heat and Air is one of only ten Lennox dealers in Tulsa, OK. As such, we can provide you with popular Lennox products without breaking your budget. Don’t see a brand listed here? Call us anyway. We’ll work with you to ensure you feel completely satisfied with our cooling and heating installation services. 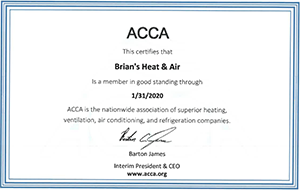 At Brian’s Heat and Air, we understand that your HVAC system represents a sizable investment. Naturally, you want to feel confident that your new purchase will last for years with minimal maintenance. So when you call on our team, you can expect us to treat you with professionalism and care. We keep our services available 24 hours a day, 7 days a week, so you don’t have to wait long for your new install. Additionally, you can count on us to provide accurate quotes on parts and labor. We’re happy to provide heating installation in Tulsa, OK and the surroundings areas. If you’d like to learn more about our installation process, call us at (918) 834-0662 or (918) 951-5835. And don’t forget to ask about current rebates and discounts. $5.00 dollars off a service call or $25.00 dollars off a major equipment change out.